Josh61's idea caused me to have my own idea for how we (try to) stop new users posting low quality questions: compulsory multiple choice quiz! Have you provided as much detail as possible? Have you included any research (e.g. what a dictionary or thesaurus has said) in your question? If they click "Yes" to all, it proceeds to post the question. If they click "No" to any, they get a screen showing extended guidance on that subject, and a "Edit Your Question" button. Yes there will be people who click "edit your question", do no editing, and just select "Yes" to all to make their question get posted. But, hopefully, it would improve a significant proportion of first time questions by making sure that people have read the guidance. I like the spirit of your idea, but I don't know how effective it would be. It's not hard to imagine users checking ‘Yes’ to the first question, even if their questions are very scant on details. (It just seems like the "right" box to check, whether it's true or not.) The second question might provide a nudge in the right direction. Warning: Questions that fail to provide sufficient context or demonstrate prior research may be downvoted or closed. The figure above comes from codingame.com, a website for programming challenges, where users can contribute challenges. 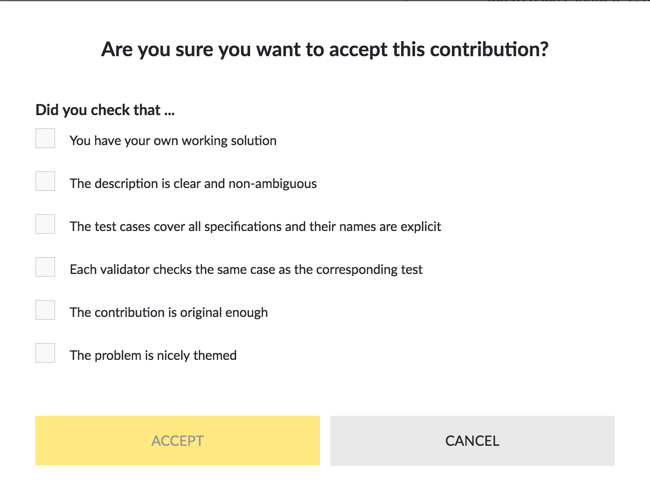 This box (overlaid on the whole page) is shown when a user clicks on "Approve this contribution". We see that this gives the users some opportunity to realize that they have not done something in accordance to the guidelines (if any), because this feels like accepting terms and conditions, which (at least for me) should give more impact to the users instead of multiple-choice questions with obvious answers. Also, the "Accept" button is disabled until you check everything in the list. True that this doesn't prevent people who just mindlessly clicking all the check list, but I do believe this is better than multiple-choice questions.